Beautifully engraved certificate from the QuePasa.com, Incorporated issued in 2000. This historic document was printed by the United States Banknote Company and has an ornate border around it with a vignette of the QuePasa.com company logo. This item has the printed signatures of the Company's Chairman of the Board and Secretary and is over 3 years old. quepasa.com, founded in 1997, is a leading Spanish and English online destination offering a diverse assortment of cost efficient, performance driven opportunities for interactivity and interconnectivity with the rapidly growing Latin marketplace. One of the pioneers of Internet en Espa�ol, quepasa originally launched it's portal offering in summer of 1998, partnering with search company Inktomi for web search; integrating products from Critical Path as an electronic mail platform. In 1999, quepasa became a national sensation almost overnight, investing millions upon millions of dollars in thousands of outdoor Spanish-language billboard advertisements from coast to coast; through heavy network radio promotion; and various aggressive national television brand-building campaigns featuring the music of it's then-corporate spokesperson and investor, Gloria Estefan. 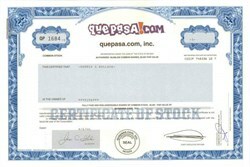 That same year, quepasa, then 15% owned by national Spanish language broadcaster Telemundo, would complete numerous rounds of private financing followed by a successful stock offering on the Nasdaq National Market exchange, its shares rising to a public market value of $350 million dollars at their peak. Shortly thereafter, quepasa begin leading industry peers in popularity surveys - eventually beating out Yahoo! en Espa�ol, Starmedia, and others, as the most recognizable Internet brand to U.S. Hispanics as ranked by various market surveys in calendar year 2000. Quepasa's former strategic partners included U.S. Computer retailer Gateway Inc., who paid $10 million for a 7.6% percent stake of our stock shares in 2000, Telemundo Network Group LLC, Fox Sports World Espa�ol. Past investors include Fourteen Hill Venture Capital, L.P. (San Francisco), Roth Capital Partners, and football star John Elway. In June of 2002, a group of investors and principal members of the original quepasa management team assumed control of the company with a substantial plan to overhaul our business - resulting in quepasa's acquisition of search company Vayala Corporation. In October of 2002, the acquisition was completed and all product offerings were consolidated under the quepasa brand. While our mission at quepasa has remained the same, our focus has improved: to maximize our efficiency as experts in performance based marketing for active participants in the rapidly growing online Latino universe. Quepasa now operates its own patent-pending proprietary search technology, in addition to other proprietary technologies and product offerings, including Quepasa News, Sports, and Business channels, reaching millions of unique monthly visitors throughout the United States and Latin America. Current investors in Quepasa include senior executives of UT Starcom, Inc. (Nasdaq NMS: UTSI), SOFTBANK China Ltd., executives of About Voice Ltd. (Hong Kong), award winning movie producer/director Paul Mazursky, as well as the JP trust and the Marriott family trusts.